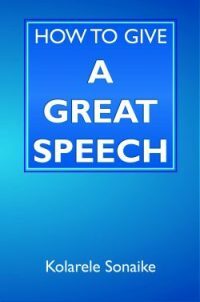 The Great Speech Consultancy - Start Here! If you’re anything like me, time is short and you’ve got a thousand and one things on your plate fighting for your attention. So you don’t have to search all over the place to get started, I’ve created this page designed to get you started on the right path. Hope it helps. Just choose your level! WHAT IS YOUR PUBLIC SPEAKING LEVEL? Public speaking ranks higher than death in surveys about people’s fears. No matter who you are, when faced with an audience of people, your nerves are going to kick in. So, if the thought of giving a speech brings you out in a cold sweat, you are by no means alone. Apart from some tips & techniques (free download here), there’s one big thing you must know public speaking nerves, and once you do, it won’t seem so daunting. What do I do about my nerves? The ability to convince other people about what you do in a very short space of time is such a key skill to have. This is where your Elevator Pitch comes in. It’s a concise summary of your business or idea designed to get whoever you are speaking to, to buy into what you do. Elevator Pitch School is an entire workshop devoted to helping you develop an effective pitch. Download the Free Cheat Sheet to get onto the school’s waiting list. You get up to the microphone to speak, open your mouth to form your words, and suddenly your mind goes blank. Don’t worry. It happens to everyone. It’s happened to me. It’s affected some of the greatest public speakers in history. 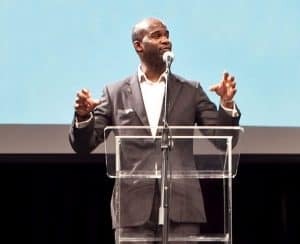 Practice is always key of course, but there are also some specific techniques that will help ensure that the next time you get up to speak, you words will be right there for you. Have you noticed how certain people just seem to be able to capture the attention of everyone in the room without trying? When you’re in conversation with them, they make you feel like you’re the only one in the room; when they’re at the podium, it sounds more like a casual chat than a cold and formal speech. It may seem like some people are just born with charisma, but like everything else in communication, there are tips and techniques you can learn to great effect. Here are 5 Habits of Highly Charismatic People. A Free Ebook. Yes, Free! The next level of communication is Storytelling. Forget the facts and the stats! If you really want to change minds, and move people to act, or change their minds, tell a good story. Neuroscientists have discovered the dynamic effect of stories on people’s brains. It is the least used, yet most effective method of persuasion, and if you can learn how to tell a good story, you will take your public speaking to the next level. Fortunately, stories have a very simple structure that you can master. Particularly for business presentations, people have a tendency to follow the age-old structure that you have to tell ’em what you told them, tell ’em, then tell ’em what you just told ’em. But this just makes for boring, and repetitive presentations. There is a far better way to structure your speech. It is the structure that great speakers from Steve Jobs and Michelle Obama to Nelson Mandela and Winston Churchill use to help them give effective speeches that people will remember. After nerves, one of the biggest questions people have relates to body language, and specifically ‘what should I do with my hands?’. You may have heard about the research that suggests that tone and body language play a huge part in people’s understanding of your message. In this article, I deal directly with this tough question. The good thing for you is that there is no one way to use your hands when you are communicating. It depends on what works best for you. What on earth do I do with my hands? Are you a leader? How well do you communicate? If you are in a position of leadership (e.g. CEO, manager, director, chairman, president) you already know that (after your actual ability to do the job), the single most important skill you need is the ability to communicate with conviction and persuade with passion. My Executive Coaching programme is tailor-made to help you develop into a great communicator using and building on your own natural personal style. It’s hard work but fun and so rewarding.Give me a call! When you have a major speech to give, you should spend most of your time practising your delivery and as little time as possible worrying about the content of your speech. That’s where a great speechwriter comes in. I love nothing better than taking what’s already inside your head and getting it down on paper in a way that will really resonate with your audience. I’ve done this for CEOs & Chairs, Directors and Managers, Presidents of charities and Solopreneurs. I’d love to write for you.